We organise free OBF Academy webinars around once a month and both customers and non-customers are welcome to join those sessions! The webinars are a great way to hear and see how different organisations are using Open Badges in their activities. Next webinar will be on Tuesday Nov. 13th at 2pm GMT (winter time will be observed then) and we have Mika Piipponen from EHYT ry (Finnish Association for Substance Abuse Prevention) presenting their case. Read more and join us then. Read more about OBP and GDPR here. We’re happy to announce that the awaited endorsement feature will be released on Tuesday Feb. 20 in Open Badge Factory having an effect also on Open Badge Passport! The possible endorsement will be visible in the badge’s information for the badge viewer in Open Badge Passport. A tutorial video about endorsement will be released in the upcoming days! There will be a free OBF Academy webinar about endorsement happening on Tuesday Feb. 27 at 2:00 pm GMT ():00 am EST, 16:00 EET). Check details here and join! Open Badge Passport and Open Badge Factory services will be under maintenance on October 31 from 7:00 am GMT to 2:00 pm GMT (9:00 EET - 16.00 EET). We’re sorry for any inconvenience! 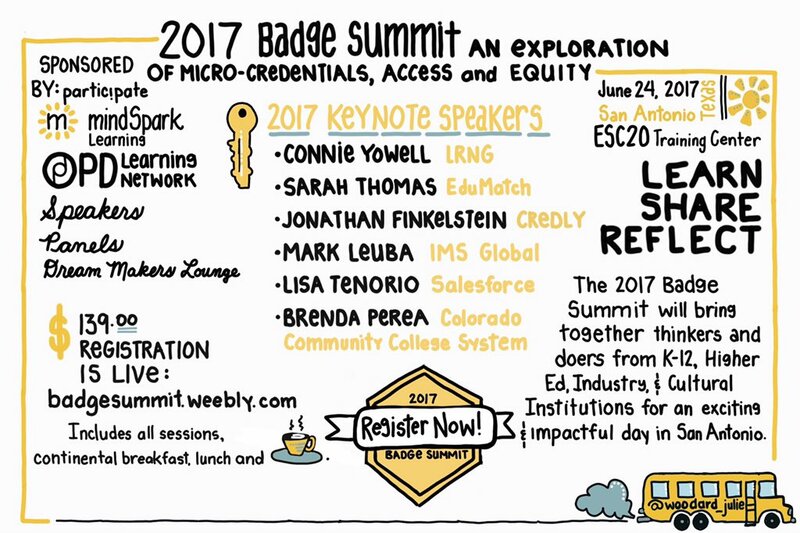 OBP at Badge Summit and ISTE in June! Soon you can apply for more badges! A new feature will be updated to Open Badge Passport, which enables organisations using Open Badge Factory to advertise their own badges in Passport’s Gallery → Apply for a badge page. The aim is to give better visibility to Open Badges so users would find badges they are interested in and could create different paths for themselves by earning badges. Badges that can be applied for are in the Gallery → Apply for a badge area. Users can search for badges by the name of the badge or by the issuer organisation with the Search tool. NB! Badges allocated to the user’s country are shown first by default but by choosing All from the menu the user can see all badges that are advertised all over the world. By clicking the » Apply for the badge link, the user will see more detailed information on how they can apply for the badge or if an event, course or similar is associated with the badge. If the badge seems interesting the user can add the badge to Favorites making it easy to search for the badge again later by using the Favorites tag. This way the user doesn’t have to fill out the badge application right away as the badge is saved and it’s possible to fill out the application when the user has the time to do that. Don’t be disappointed if you can’t find a suitable badge for yourself right away! New badges and applications are being published little by little so make sure you check back every now and then, you might be pleasantly surprised! Open Badge Passport will be updated on Tuesday Nov. 8th at 15:00 EEST (14:00 BST). The platform will be unavailable for about an hour due to this. Open Badge Passport will be updated on Monday Oct. 24th at 15:00 EEST (14:00 BST). The platform will be unavailable for about an hour due to this. Users can add comments to all badges in Open Badge Passport. All logged in users can read comments on badges. When users follow a badge, they will get notifications regarding the badge for example when the badge gets comments. From the Connections area, users can manage the badges they follow. Open Badge Passport will be updated on Tuesday Oct. 10th at 16:00 EEST (14:00 BST). The platform will be unavailable for about an hour due to this. On Monday 27.6. between 15.00-16.00 our service will be down for maintenance. Open Badge Passport will be temporarily unavailable. Sorry for the inconvenience. New Open Badge Passport is here! Open Badge Passport has been released on a brand new platform today, June 16th 2016. OBP is now faster, safer and completely open source. We are now also able to develop new features faster due to the new release. We are also inviting anyone interested in Open Badges and open source projects to take part in this ongoing development of Open Badge Passport. What kind of features you’d like to see in Passport? Take a look at salava.org, register, submit your ideas and thoughts and even take part in developing new features.